Thanks so much for everything! You catered to your every need and really spoiled us! You made us feel so welcome in your wonderful home! 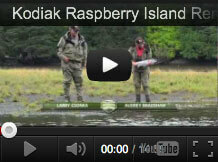 Raspberry (Island Remote) Lodge is a great place to stay! The cabins are perfect! The food fantastic! The fishing was so much fun! Of course, the women outfished the men!! Birch is and awesome guide!! Can’t say enough about all he did for us! From the first day: Whales, sea otters, a Sea Lion eating a salmon and a bear to the last day: the biggest salmon of our trip! It was all tremendous! Can’t wait to return!! 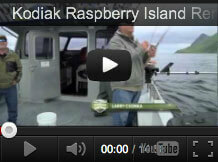 From the moment we boarded the boat on Kodiak it has been a treat. Birch treated us to a full symphony of whales blowing and diving and showing us tail on the trip out. Then a multitude of otters were on display with a sea lion with a salmon in his mouth in their midst. We arrived and the whole clan greeted us like they had waited months for us to get here. We kayaked the same afternoon and while watching an eagle on her nest were treated with a bear calmly eating grass and not minding us a bit. Fishing was so much fun the next day and the guys finally learned how to help Birch a little, while the girls reeled in the King SALMON! Everything has been excellent including the accommodations, food and activities. Everyone has been so service oriented and want you to be so pampered. We have enjoyed everything immensely including the kids and dogs. Tiffany is a ***** (five star) chef. Yummy cookies!